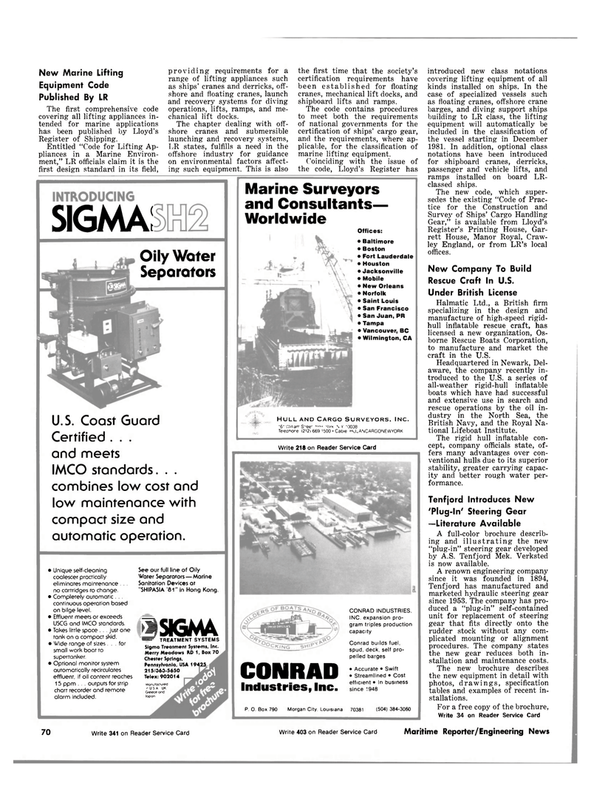 Entitled "Code for Lifting Ap- pliances in a Marine Environ- ment," LR officials claim it is the first design standard in its field, providing requirements for a range of lifting appliances such as ships' cranes and derricks, off- shore and floating cranes, launch and recovery systems for diving operations, lifts, ramps, and me- chanical lift docks. LR states, fulfills a need in the offshore industry for guidance on environmental factors affect- ing such equipment. This is also the first time that the society's certification requirements have been established for floating cranes, mechanical lift docks, and shipboard lifts and ramps. The code contains procedures to meet both the requirements of national governments for the certification of ships' cargo gear, and the requirements, where ap- plicable, for the classification of marine lifting equipment. Coinciding with the issue of the code, Lloyd's Register has introduced new class notations covering lifting equipment of all kinds installed on ships. In the case of specialized vessels such as floating cranes, offshore crane barges, and diving support ships building to LR class, the lifting equipment will automatically be included in the classification of the vessel starting in December 1981. In addition, optional class notations have been introduced for shipboard cranes, derricks, passenger and vehicle lifts, and ramps installed on board LR- classed ships. Register's Printing House, Gar- rett House, Manor Royal, Craw- ley England, or from LR's local offices. Halmatic Ltd., a British firm specializing in the design and manufacture of high-speed rigid- hull inflatable rescue craft, has licensed a new organization, Os- borne Rescue Boats Corporation, to manufacture and market the craft in the U.S.
British Navy, and the Royal Na- tional Lifeboat Institute. The rigid hull inflatable con- cept, company officials state, of- fers many advantages over con- ventional hulls due to its superior stability, greater carrying capac- ity and better rough water per- formance. A full-color brochure describ- ing and illustrating the new "plug-in" steering gear developed by A.S. Tenfjord Mek. Verksted is now available. Tenfjord has manufactured and marketed hydraulic steering gear since 1953. The company has pro- duced a "plug-in" self-contained unit for replacement of steering gear that fits directly onto the rudder stock without any com- plicated mounting or alignment procedures. The company states the new gear reduces both in- stallation and maintenance costs. The new brochure describes the new equipment in detail with photos, drawings, specification tables and examples of recent in- stallations. USCG and IMCO standards. • Takes little space . . . just one rank on a compact skid. • Wide range of sizes. . for small work boar ro supertanker. • Optional monitor system automatically recirculates effluent, if oil content reaches 15 ppm . . . ourputs for strip chart recorder and remote alarm included. Saniration Devices at "SHIPASIA '01" in Hong Kong.